Double Duty Dinner! Tonight’s dinner has lots of favorites and large quantities so that we will have extras in the fridge. Mexican vegan Falafel Bites (recipe from cottercrunch) served with homemade hummus (recipe from Minimalist Baker), our black bean veggie salad, quinoa and grilled chicken. So much yum and something for everyone! 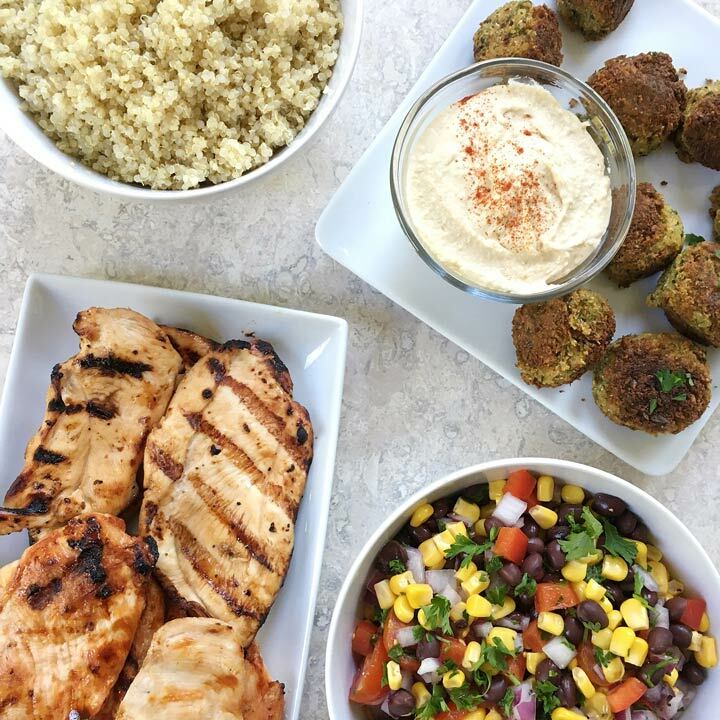 Mexican vegan Falafel Bites served with homemade hummus, our black bean veggie salad, quinoa and grilled chicken. So much yum and something for everyone! 1 can of black beans, drained & rinsed. 1 can of corn, drained & rinsed. 1 red or green pepper, chopped. 1 tomato, chopped OR approx 1 cup cherry or grape tomatoes halved.